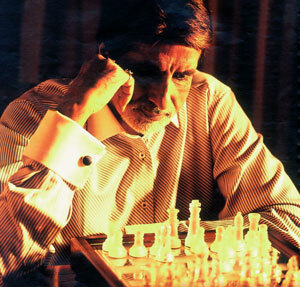 Veteran of Bollywood (he insists on calling it the ‘entertainment industry’) with a hundred films and celluloid roles under his belt, Amitabh Bachchan’s most stylish role is undoubtedly, playing himself. Unorchestrated by designers and unencumbered by stylists, the most ritzy character that he plays is, in fact, Amitabh Bachchan. Foot-stampingly impatient at being described a style icon, he is unable to recognise his own panache. An interviewer’s nightmare, he sidesteps questions on his ‘look’ with particular agility. My parents were very progressive for their age, in the 40s. They broke norms. They gave us the liberty and freedom to do what we wanted. We have adopted a similar temperament with our kids. At the end of the day, my kids do come out with flying colours. I don’t know what we learn from our children. A bit of French, perhaps! After all, they did go to Swiss schools. In this age to ask ‘how do you know?’ is absurd. If you can read, you know! I don’t do anything that is orchestrated. Recently, there has been an upsurge of very controlled groups who manage the ‘look’ of a film. I have been subjected to these people. Other than that, what the director wanted, I wore. If I give you a time, I should keep it. You have a watch. Look at it and be on time. The media makes a hoo-ha about everything. I was petrified of being on television. I still am. I lose weight. I become crabby. It is not an easy role. There is no such thing as ‘superstardom’. We are all just actors. Method acting is too complicated for me. It is a waste of time, really. Abu-Sandeep design my ethnic clothes. They are also personal friends of the family. I like anything that is trendy – Armani, Versace…. I shop for myself. It’s nice to go post your own letter, buy your own groceries. I do enjoy the anonymity when I travel abroad. On occasion I have taken my grandchildren to shop for toys, in Mumbai. I write with my right but I do everything else with my left. It would be a terrible day for an artiste to be completely satisfied.